The crew have an in-game podcast, analyzing the Mexico play under Tata as they get another victory. The title says it all, Mexico lost 7-0 to Chile’s national team in Copa America Centenario’s final quarterfinal match up, and it is single handedly the worst loss for the Mexican National Team in all its history within Copa America participations. 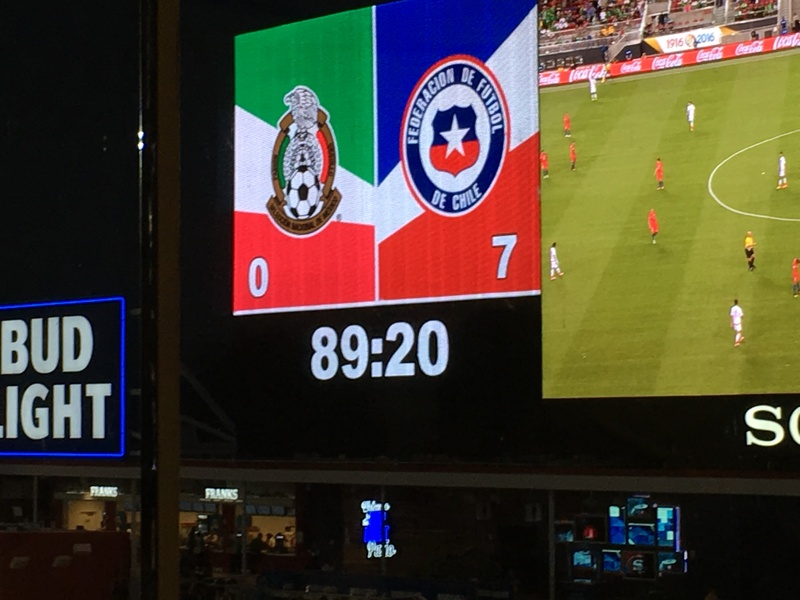 Mexico lost 7-0 in front of 70,547 TRI fans, who congregated at the Levi Stadium in Santa Clara. The Mexican fans began to leave the stadium early as soon as Mexico had allowed 4 goals in the 52nd minute. The goals kept on coming. Like a bad dream that you are unable to wake up from. Mexico could barely muster 40% possession in the entire 90 minutes. 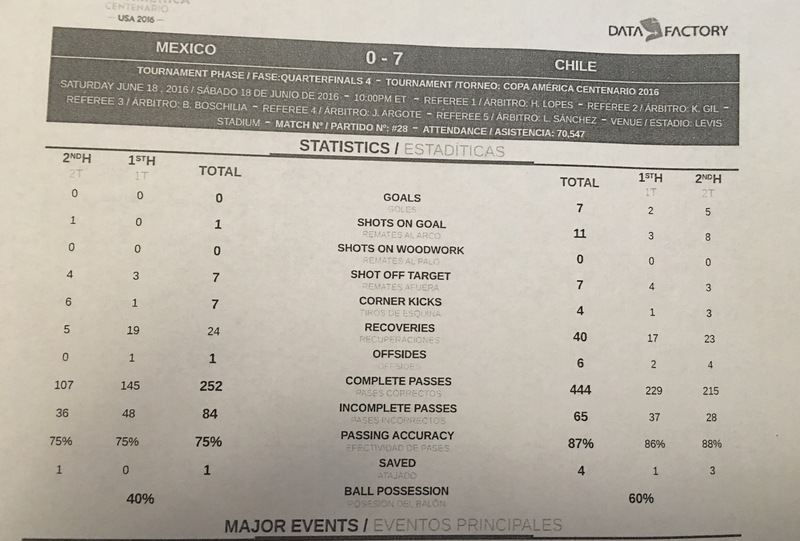 Mexico had only 1 shot on goal in 90 minutes, also a meager 75% passing completion rate. The Mexican midfield was ran off the field. Juan Carlos Osorio felt Mexico was still in the game, after all, Mexico was down 0-2 at halftime. He made 2 substitutions, took out Duenas and Chuky Lozano and debuted Gullit Pena and brought on Raul Jimenez. These changes had an immediate impact, by Mexico allowing 3 goals at the beginning of the 2nd half and be down 5-0. Clearly Mexico was done for, so Osorio took out an attacker, Tecatito Corona for a defender, Diego Reyes. That did not help, and Chile went on to score 2 more goals and the humiliation had come full circle for the Mexican National Team. At this point, what does one do, in the same shoes as Juan Carlos Osorio. Coming from the hottest winning streak in Mexican history, to crashing 7-0 to the 5th ranked team in the world, Chile? You go on a apology tour of course. 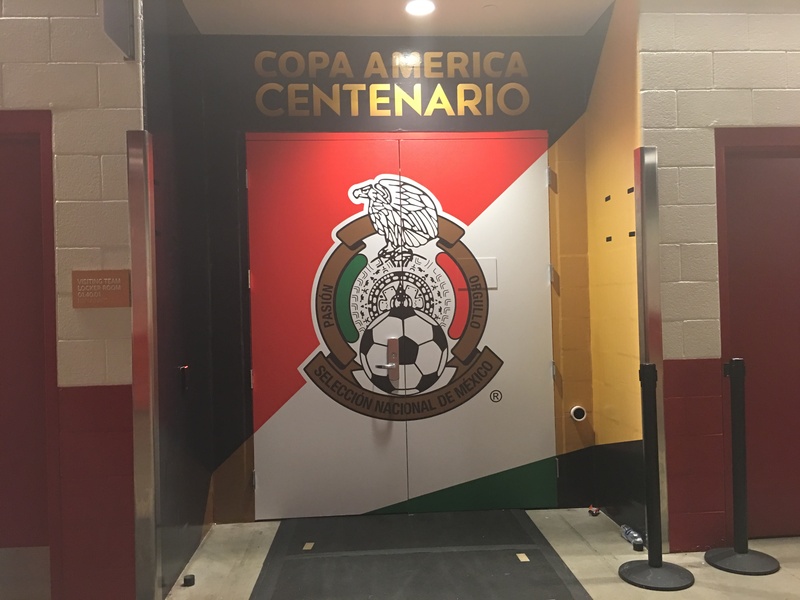 Most all the players, including Chicharito, who has been avoiding the press and mix zones in previous Copa America Centenario Matches, was the first to come out of the locker room and apologize to the fans via the press. Then one after another, national team member came and said sorry. They gave us their reasons, they said they backed the coach and that they trust him completely. They all sang the same song and dance. Santiago Banos who is the sporting director for the Mexican National Team also came out, and declared that coming from a record winning streak, to this loss of this magnitude, it can be considered an accident of Futbol. Almost hinting at this will never happen again. He also stated that he backs Juan Carlos Osorio, and that there is no plan B to replace Osorio. Maybe Mexico needed this painful defeat. This generation has been dubbed, the most talented in our storied history of this National team. Maybe we need to fall, to taste rock bottom. Another door closed for the Mexican National team. Let us ride into the sunset, until a new opportunity arrives for Mexico to rise once again, and other doors open in 2017 and 2018. Despite losing 3-0 to Mexico at BC Place Friday night, Canada still sits in 2nd place in Concacaf Group A, which would be enough for Canada to make the final Hex. If they manage to hang on, and it is a big if, then the City of Glass will hopefully be in the rotation of venues. Please, please let it be in the rotation of venues. I am not going to lie. The big part of the allure of covering this game was going to Vancouver. Oh, and the game as well – there was that too. It all seemed to come together: Vancouver’s proximity to Seattle. The ridiculously small amount of points to fly from Austin to Seattle. The fact that it was a nonstop flight. My TV schedule was clear. So off I went. The flight is long, and since I was not on the airline where I enjoy premium status, it was not particularly comfortable – a 4 hour flight will do that to you. That part of the world is so lush and beautiful, and with good reason. My 150 mile drive up to Canada provided my with no less than 8 bouts of rainfall. Makes sense why the call it Raincouver. BC Place was expecting a big crowd, and it turned out to be the biggest crowd ever to watch a men’s game there (the WWC Final was also played at BC place). What I did not know, though, is that Vancouver is home to about 12,000 Mexicans. 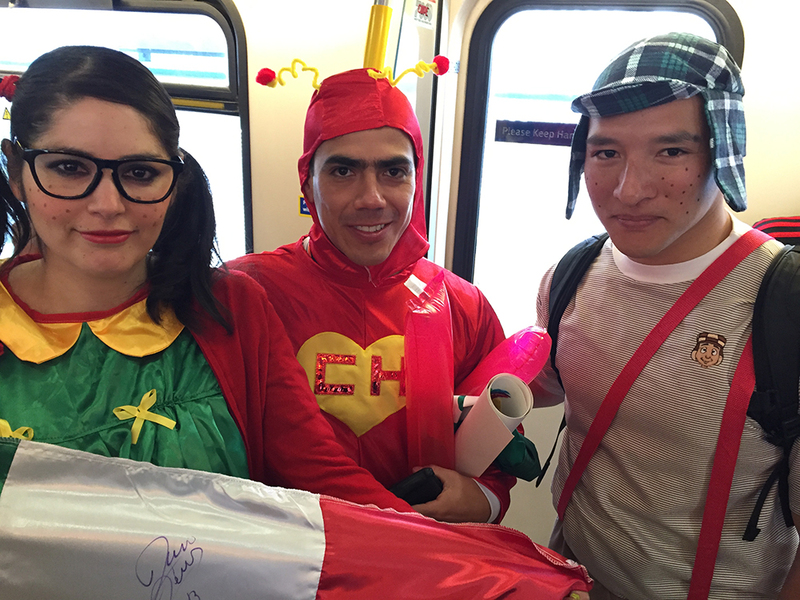 I ran into a few of them on the train ride down to BC Place. I wasn’t entirely sure if they were rooting for Mexico, so I had to ask. They were. While I was enjoying my mushroom ravioli dinner in the Media Tribune, a Canadian journalist was telling me that Vancouver is an event driven city. The locals have their hockey and their BC Lions, and Whitecaps, but nothing draws more than the one-offs, he told me. Once the stadium was filled, the split was about 70/30 in favor of Canada. It was a great crowd, and the Press Box I was in was right next to the Voyageurs supporters section. They were great the whole night, waving Canadian flags as well as the flags of the Canadian Provinces. ESPN’s Tom Marshall and Mexican Soccer Show’s Wiso Vazquez were able to identify more than I could. In the end though, Mexico’s quality was too much for the Canadians to handle. The last 20 minutes saw Mexico play more keep away then attacking the Canadian goal. Canada may not have the horses to compete with Mexico, but they have a really good chance to make their first hex in 20 years if they can get past both El Salvador and Honduras. They get the former at home and the latter on the road. Just don’t ask any Canadian about the last time they went to Honduras. But if Mexico gets to go back to Vancouver in 2017 for the Hex, I am sure the Canadian won’t mind talking about that game as much anymore. Last season FC Dallas came within a game of the MLS Cup relying on youngsters and locally cultivated talent. Youngsters will have times when they slip up, as they did last week in the Tejano Derby vs. Houston, a 5-0 pasting by the Dynamo. Determined not to let that happen again, coach Oscar Pareja instructed his players to play within themselves, use they had practiced, and above all, forget what happened last week in the Bayou City. It took some doing, but FC Dallas finally broke through in the second half with a placement over power free kick by Mauro Diaz in the 80th minute. His fellow Argentine Maxi Urruti iced the game with a solid effort of his own – a screamer that found the top corner of the net 7 minutes later. The score would stay at 2-0, sending the faithful home happy after having to deal with some unseasonably chilly weather in North Texas. The result should not have been much of a surprise, considering FC Dallas had the Lion’s share of possession. Were it not for a few spurts at the open of each half by Montreal, the dominion of the round ball would have been Dallas’ and Dallas’ alone. There was a reason for that. After studying film, Oscar Pareja instructed his players to bracket Impact playmaker, Ignacio Piatti and limit his off the ball movement. Piatti started strong, but his influence on the game diminished rapidly, and by the middle of the second half, he had all but disappeared. With it, much of Montreal’s possession. Impact did find some fresh wind when their Ivorian superstar, Didier Drogba, made his 2016 debut. In fact it seemed that the former Chelsea icon inspired both teams to pick up the pace. FC Dallas seemed to be in a hurry to score a goal before Drogba, and Montreal wanted to make that happen. Despite his legend status, though, the stars of the the show tonight were the FC Dallas midfielders. The holding midfielders Carlos Gruezo and Victor Ulloa were excellent in repossessing the offense, while Fabian Castillo, Michael Barrios and Mauro Diaz all took turns with daring and darting runs into the danger area. Their speed and ball control gave Montreal fits, they just could not complete the play with the ball in the back of the net. Usually that spells trouble – a player like Piatti, and Drogba, of course, can make teams pay for their offensive shortcomings. But nothing it was unnecessary foul just at the top of the box gave Diaz the chance to showoff his free kick skills. His shot badly fooled Montreal keeper Evan Bush, and gave the 14,502 fans the moment they had hoped would happen all night. With Montreal opeining up to try and find the answer to equalize, it was FC Dallas who put an end to things a few minutes later with Urruti getting his 2nd goal of the season. The Atmosphere at Toyota Park is lively, but a little labored. There are drums, a small group of ultras, and the same chants we hear everywhere – but the local flavor is what stands out the most. It was good to hear the crowd sing “Deep in the Heart of Texas” and a trumpet player belted out the theme to the “Dallas” TV show in the 2nd half. In case I had forgotten where I was. Dallas has a good young team and as solid a midfield as one will see in MLS. If they can somehow limit the inconsistencies that are a product of youth, they will have a part to play in determining the Western Conference champions. As it has in the past years, Liga MX’s second season takes a while to hold root. Hardly a surprise, given the short turnaround, and the propensity for the majority of teams to make over its rosters. Teams have little time to get back into form, so listless uninspired matches litter the first couple of weeks. Nevertheless, some teams manage to get the WD-40 in the right places sooner than others. Let that be a lesson to those who throw the little straw away after purchasing the can. No Gullit – no matter. The Beast went into one of the more underrated atmospheres in Liga MX – the always full, and always steamy Luis Pirata Fuente stadium in Veracruz. The green bellies are one of 2 undefeated teams in Liga MX, along with Monterrey. Luis Montes has started off the season on a hot streak, and is positioning himself nicely for not only a call-up for the February friendly vs Senegal, he would be a fine addition to the Olympic team as one of the 3 overage players. The one downer for the emeralds was the loss of the oft-injured Chaton Enriquez, who left the game with his ankle the size of a cantaloupe. Luckily for him, he will only miss a couple of weeks. We could have just as easily picked Hobbit Bermudez’ scissor kick against Monterrey, but Puebla ended up wasting his glorious strike by losing 3-1. To that end, Javier Aquino scored the goal of his life in Tigres’ home opener against Morelia, a 2-0 win. It is no surprise that Tigres had a slow start to the season, given their lack of pre-season after winning the A15. They went nearly 2 games without scoring before Aquino, whose career has been resurrected in Monterrey, gave the champs the shot of adrenaline they needed to get things in gear. Runner up: Hobbit Bermudez vs Puebla. If he was 4 inches taller and had about 10 more pounds of muscle, he might well be Mexico’s best player, given his sensational ball skills and vision. With a body better suited for a jockey than a midfielder, he keeps plugging along. This scissor kick opened the scoring in Puebla’s newly refurbished Estadio Cuauhtemoc. Honorable mention – Orbelin Pineda vs Cruz Azul. Dorados did what they absolutely could not do: lose at home. They needed 20 points from the A15 to have a realistic chance at avoiding the ignominious “one & done” in the top flight. They only collected 15 after falling into the most common of all traps – complete roster make-over. Instead of relying on the players that earned promotion, the front office spent like a college freshman with daddy’s credit card. A whole new roster takes time to gel, and Dorados has yet to firm up, and they may not this season. They need to collect at least 25 points this season to avoid the plunge. Ain’t gonna happen. One would think that the Leon Lesson of dancing with who brung ya would be the blueprint. A Dorados drop will make it two in a row of the “one & done” along with UdG’s cup of coffee last year. Club America gave Atlas a triple dose of reality with a 3-0 win at the Jalisco. Rafa Marquez’ body only lasted a half, and Atlas fell apart in 2nd stanza. Barra 51’s name will survive another year. Miguel Herrera got his first win for Xolos. He will get the most out of them, but no one knows haw far that will take them. Pumas gave a little nod to yesteryear with a quasi throwback uni, and then held on to beat Toluca 3-2. Was last season an aberration? We’ll see. Perpetual weed lurkers Santos and Pachuca also locked up their first wins of the season. They both have rosters that should be competitive throughout the season. We’ll start in Veracruz. Upset that a very iffy red card was handed out to one of his players in Veracruz’ 3-1 loss to Leon Friday night, Red Sharks owner, Fidel Kuri, decided to take out his frustration on the FMF head of refereeing, Edgardo Codesal. “I told him he has got to go. 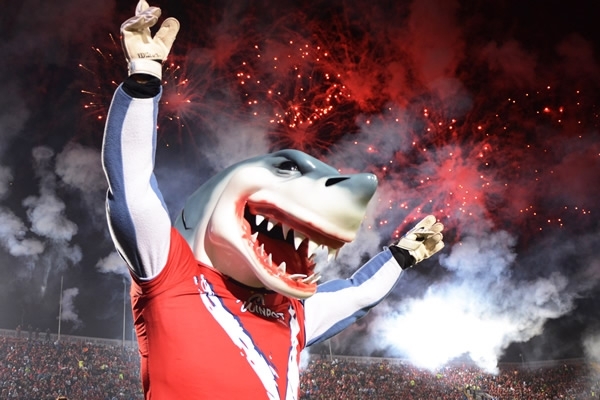 He does not work for Mexican futbol” The Head Shark said after the loss. “They can punish me if they want, but he (Codesal) has to go.” Kuri even went to look for him in the parking lot after the match. We all know that there is a lot of passion involved. But it is not as if Kuri is a repeat offender. Frankly, I always thought Veracruz was a Televisa shell company. The reaction, and overreaction has been great theater. He will be sanctioned, and that’s it. As it should be. Puebla opened its doors to their shiny new baby over the weekend. After the game, the Estadio Cuauhtemoc looked like the Delta Tao Chi house after a toga party. The reason? Monterrey fans traveling in support of the Rayados set fire to the stadium, and then tried unsuccessfully to put it out by draining their lizards on the blaze. Justice was swift. The FMF did not waste time in punishing the Monterrey side: they received a fine, will have to pay for all the repairs, and their registered fan support clubs are not allowed to travel to away games for the rest of the season. Monterrey took it one step further by announcing that if any of the accused were season ticket holders, the tix would be revoked immediately and they would have to wait until next year to apply for them again. The real losers are the Monterrey fans, where 99% are loyal, passionate, loud, and respectful. All it takes is a few to ruin it for everybody. There are a few certainties in this world: death, taxes, and coaches heads rolling after a month in Liga MX. It is no mystery who the leading contenders are to walk the plank, just look at the bottom of the table. Luis Fernando Suarez will not last long at Dorados if he does not string a few wins together and fast. It might be time to find a fixer in Culiacan. Victor Vucetich’s Queretaro has yet to win, but given King Midas’ history, he has earned a rather large benefit of the doubt. Puebla and Veracruz have not had the best starts, and a precipitous slide into the drop zonecould well mean curtains for Pablo Marini and Liga MX living legend, Carlos Reinoso. There have been plenty of folks who have put their considerable expertise on display in making predictions for the upcoming year. They all go through the usual gambit of games, players, titles yada yada yada. They may know what they are talking about, but, honestly, who can make any predictions about the most unpredictable league and national team on the planet? This guy can – and here we go. It is amazing how much clarity eating a Merciless Pepper of Quetzalacatenango can provide.